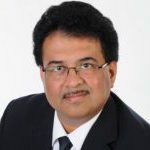 Mr. Thandav (RT) Murthy has joined Etegra as our Chief Operating Officer. He comes to Etegra after leading infrastructure engineering practices with the largest multinational Engineering/Construction firms where he served as Vice President, Practice Builder and Programs Director with key responsibilities including Operations and Sales. His roles included being the functional group lead for design, construction management, program management, environmental, alternate financing and advisory services. He managed personnel resources and ensured adequate resourcing of all AE and PM/CM pursuits. In addition to Infrastructure Business Line responsibilities he was the Regional Federal Business Line Director responsible for sales, resourcing, program oversight, and the US Army Sector Lead for the south-southwest. His specific expertise has been in creating new businesses, strategy, planning, budgeting, implementation of short term and long term plans, day to day execution of operations teams, profit and loss reporting. Mr. Murthy has extensive experience in professional civil engineering, including design, project management, program management, and construction management; with a focus on general/heavy civil engineering, facilities, dams, levees, tunnels, environmental compliance, NEPA, water resources, and conveyance. Mr. Murthy has an intimate understanding of numerous federal clients to include US Army Corps of Engineers (USACE), Air Force Civil Engineering Center (AFCEC), Naval Facilities Engineering Command (NAVFAC), US Customs and Border Protection (CBP), Department of Homeland Security (DHS), General Services Administration (GSA), Veterans Administration (VA), US Fish and Wildlife Service (USFWS), US Department of Agriculture (USDA), Bureau of Engraving and Printing (BEP), Department of Energy (DOE), National Security Agency (NSA) and National Nuclear Security Agency (NNSA). As the Chief Operating Officer, Mr. Murthy will not only ensure technical excellence in the foundational areas of design and project management, he will also provide key support in areas of expertise that include energy efficiency, PM/CM, design of projects for secured facilities, civil works, military construction, and environmental. Mr. Murthy will not only oversee active contracts, but will also assist in the winning of new contracts and supervise Program and Project Managers on active contracts with the USACE, AFCEC, NAVFAC, VA, USFWS and USDA.